This chapter will explain transformative learning and its value and application to corporate training practices by promoting critical reflection on one’s “frames of reference.” This critical reflection can help one to challenge cultural and social assumptions, potentially leading the person to more democratic ways of thinking and behaving in the workplace. Cyberspace offers a unique and potentially powerful place to employ transformative learning practices, and along with explaining transformative learning, this chapter will explore how cyberspace can be used for this kind of learning. 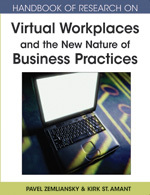 This chapter will also posit that new cyberspace environments such as Wiki’s and Second Life hold tremendous promise as transformative learning spaces because they invite small group collaboration. Theories in Use: These are the theories that a person actually uses to interpret a situation and act within it. These theories are often in conflict with a person’s espoused theories in those practicing model I behavior. Indeed, often people practicing model I behavior totally deny that they are acting in contradiction to what they say that they believe. Critical Reflection: This refers to the reflection on experience that reveals the underlying assumptions, values, and beliefs that compel a person to act as she/he does in a particular situation and to interpret the actions of another in a particular way; thus critical reflection unveils one’s “frames of reference” as Mezirow calls them or one’s “espoused theories of action” as Argyris and Schon referred to them. Critical reflection is necessary before transformative learning may occur, but critical reflection does not necessarily lead to transformative learning. Espoused Theories of Action: This refers to the theory that a person believes s/he operates under. These theories are created by the person according to his or her perceptions of himself/herself and are reinforced by his/her true but often erroneous interpretations of his/her experience and actions. For instance, s/he may believe that s/he does not harbor bias against those of other cultures, but in fact s/he may, a fact the interpretations that others make of his/her actions reveal. Model II Behavior: This is behavior that is collaborative and inclusive. Rather than seeking to dominate, people who practice this behavior strive to be democratic, inviting and encouraging weaker voices to be heard. Argyris and Schon imply that this way of behaving illustrates more enlightened and emotionally mature people. When conflict occurs in organizations acting from model II, members of the organization seek to understand and empathize with one another even while stating their individual points of view. Model I Behavior: This is behavior that is competitive and hostile. Argyris and Schon approach claiming that this kind of behavior is barbaric and uncivilized. In this behavior, individuals compete to get their own needs and wants satisfied with little thought to the collective good. Those practicing this kind of behavior seek to dominate others. Reflective Discourse: This is the use of dialogue to find “a common understanding and assessment of the justification of an interpretation or belief” ( Mezirow, 2001 , p. 10). In a group setting, participants challenge each other’s assumptions and negotiate alternative perspectives. Arguably, transformative learning cannot occur except in dialogue with one’s environment either in a group setting or in acting within the world. Frames of Reference: These are the “structures of assumptions and expectations through which we filter sense impressions” ( Mezirow, 2001 , p. 16). One’s frames of reference shape how a person perceives, thinks and feels and provides the framework by which one makes meaning of experiences. Frames of reference are “composed of two dimensions, a habit of mind and resulting points of view” ( Mezirow, 2001 , p. 17) that determine how we will choose to act in a particular situation and how we will interpret the actions or speech of others. Perspective Transformation: This is the outcome of transformative learning. Fundamentally, it is a transformation of a frame of reference that allows a more “democratic” way of perceiving and acting in the world. Perspective transformation implies not just a change of perception but action as well because it is not enough to see the world differently; one must act differently in it. For a fuller definition, see Taylor (2001 AU34: The in-text citation &quot;Taylor (2001&quot; is not in the reference list. Please correct the citation, add the reference to the list, or delete the citation. ). Transformative Learning: This involves a re-framing of assumptions that provide a different perspective on the world. As such, transformative learning leads to “respect for others, self-respect, willingness to accept responsibility for the common good, willingness to welcome diversity and to approach others with openness” ( Mezirow, 2001 , p. 14). It should be noted that this concept of transformative learning assumes that the aforementioned characteristics are positive, but the pronouncement that these are positive characteristics is a social construct.